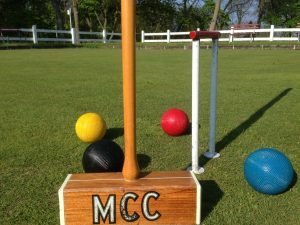 Join us in lovely Lake Park, high atop the wooded bluffs overlooking Lake Michigan, for game of croquet on a manicured green using tournament-quality equipment. 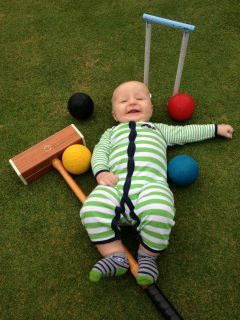 We play croquet Tuesday nights, Thursday nights, and occasionally on the weekends from late May through early August. A few of us know what we’re doing, but most of us are fairly new to the game and simply enjoy getting outdoors for some low-impact and low-stress competition and camaraderie. 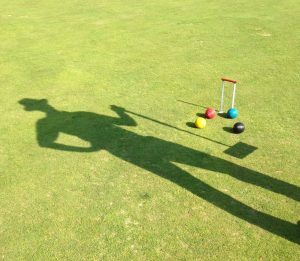 Stop by the lawn bowling clubhouse with the green and white awning next to Lake Park Bistro for some genteel croquet fun! (The lawn bowlers graciously indulge us as their guests and allow us to use their greens and share their clubhouse.) We’ll get you out on the green, show you how to swing a mallet, and have you running wickets in no time. Our Tuesday night league series starts June 13 and (you guessed it) the Thursday night league series starts exactly two days later. 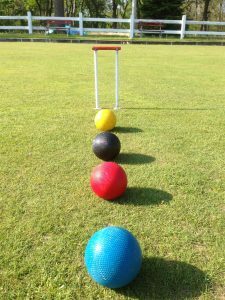 You can stop by and check us out in action during our 60-minute matches that start at 5:00, 6:15, 7:30 and 8:45 p.m. You’ll see some of the most exciting croquet action in the state, and there will be members on hand to answer questions and, if time allows, maybe even get you out on the green for a wicket or two. If you can’t make it to the Tuesday or Thursday night events and somehow miss the Friday night parties, please call or write us with any questions and to get more details about the game and our club. This summer, don’t be a sticky wicket; get off the sideline and onto the green!